Scotland is a beautiful country with so much to offer. We recently did an amazing 9 day road trip through Scotland that included Glasgow, Glencoe, Isle of Sky and Edinburgh. 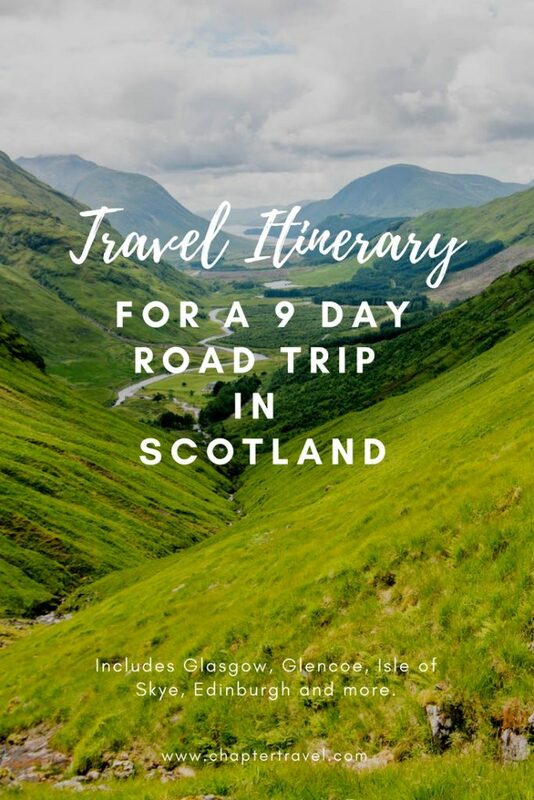 As I just couldn’t wait to share this great itinerary for a road trip in Scotland, I’m sitting here typing this introduction at the airport of Glasgow waiting for departure. Are you heading to Scotland for a road trip too and looking for some inspiration? Be sure to read this great Travel Itinerary for a 9 day Road Trip in Scotland! Next to a route for your journey in Scotland, this itinerary also includes great activities, restaurant recommendations and a car rental recommendation. The activities are all merely options of what you can do. Furthermore, this itinerary starts and ends in Glasgow, but of course you can also decide to start and end your trip elsewhere, for instance in the beautiful city of Edinburgh. If you need any help with packing for Scotland, head over to our article What to Pack for a Camping Trip in Scotland in which we share 15 travel essentials for your Scottish adventure. When we were searching for a car rental in Scotland we were mostly interested in the cost. Soon we found Easirent. We have no affiliation with them whatsoever; we just had an overall good experience. The pick up was super easy and they were very helpful. They even gave us a navigation system for free to go along on our road rip, even though they usually charge about 80 euro. For a 9 day rental car we paid 350 euro all inclusive. This is also with an insurance that covered anything, which we really recommend. It does give a peace of mind to have an insurance so you don’t need to pay for any scratches you make on the car. Other than Easirent, we found that there are loads of car rentals near the Glasgow airport. So enough options! Furthermore, if you have a different starting point, Easirent can also be found in other Scottish cities. Did you already know that camping is free in Scotland in most nature places? If you are on a bit of a budget or if you just feel like being completely in nature we recommend wild camping. This means you are camping at off the beaten track locations and not on organised camp sites. 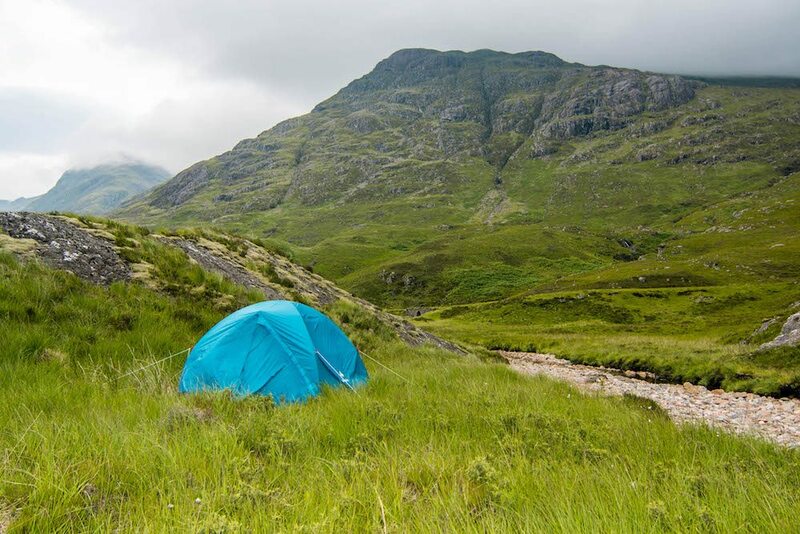 If you’re a bit unsure on where you are allowed to camp, on the website of Visit Scotland we found this Scottish Outdoor Access Code where you can find all the regulations and rules about wild camping, lighting fires, litter and human waste. We opted for a tent because it’s easy to take along with our rental car. But to be completely honest we personally would prefer a campervan. We had a lot of bugs in our tent, and Jeffrey also had two ticks after one night. This can also happen when you travel in a campervan or when you’re hiking. But during our time in Australia with a campervan we never had any bugs in our “home” like we did now. If you aren’t much of a camping fan, it is also possible to book other types of accommodation, such as a hotel, cabin or hostel. We were there during the busy season, which means everything in the Scottish Highlands is fully booked months in advance. So if you’re planning on visiting popular places in Scotland with limited accommodation, such as Isle of Skye, make sure to book ahead. Both at Glencoe and Isle of Skye we had a visit to the local Visitors Center to get advice on what to do. And both times they helped us very well and gave us enough information on what we can do. We also recommend you to have a stop there if you need any more advice about your visit to the Highlands. Be sure to take your rubbish with you when camping! At the visitors center they told us a lot of campers leave all their garbage. This is of course unacceptable. Just bring a garbage bag and take everything with you in your car or campervan when you leave. To get the most out of your first day we suggest to take an early flight in. For instance, we arrived in the morning, picked up our rental car and camping gear and still had plenty of time to explore Glasgow afterwards. We found Glasgow to be a beautiful city with amazing architecture. It’s certainly worth a visit! For our first night we booked a comfortable Airbnb ensuite-room and made sure that there was free parking for our rental car. We suggest to make sure you have free parking too, so there is no extra cost for this. For dinner we had amazing Indian food at Mother India. Apparently there is usually even a line to get a table, but we were in luck and had a table very quickly. It was affordable and delicious. Get cultural and visit the Gallery of Modern Art. Enjoy nature at the Glasgow Botanic Gardens. Visit a football match at Celtic Park. Go to the beautiful People’s Palace. The drive to Glencoe from Glasgow is approximately two hours. It’s a wonderful drive, so enjoy the beautiful scenery on the way up there and don’t forget to stop once in a while to take some photos! 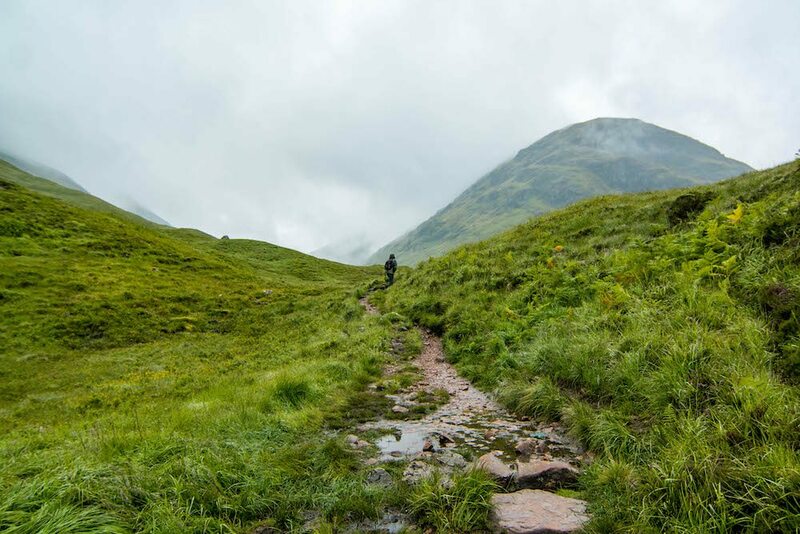 Glencoe is a perfect destination for hikes. So, if you’re into hiking we definitely recommend doing one on your first day there. We did a short hike at Coire Gabhail, also referred to as the hidden valley, as it’s where the MacDonalds of Glencoe hid their cattle. We found the walk to be quite easy and only with some parts of steep climbs. After our hike we went to town to get some fish and chips. In this little town there are a variety of choices for restaurants and a super market. Of course it’s also an option to cook your own food at your camp site. In Glencoe there are plenty of camping possibilities as well. As you can camp for free anywhere in nature, you can get creative. Go hiking and enjoy the Highlands scenery. There are plenty of hiking options in Glencoe of different difficulties and lengths. 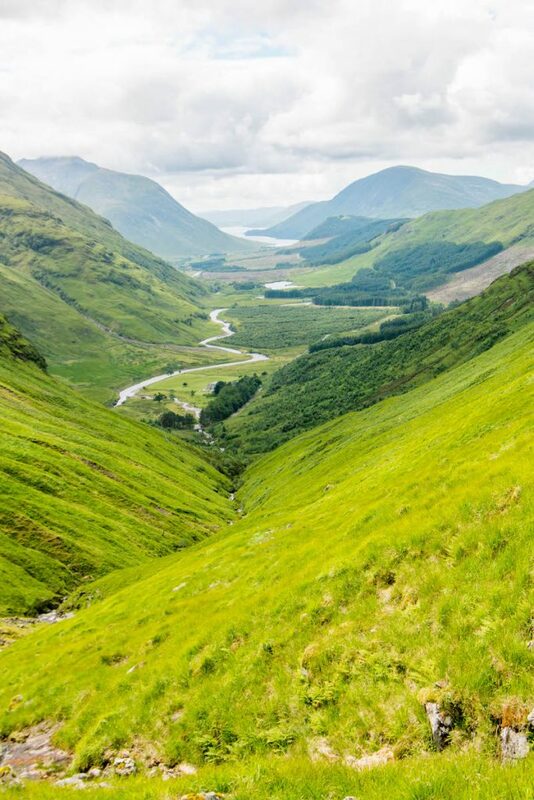 Visit the ancient volcano: follow the Glen Coe Geotrail. It’s also possible to test the waters: go sea kayaking, water rafting, canyoning or sailing. Get fish and chips at the local pub. For this day we recommend getting up early (which you will anyway if you’re sleeping in a tent) and doing another hike at Glencoe. We did a longer hike of 4.5 hours at Lairig Gartain and did a sort of loop. This walk is quite easy as it’s mostly flat, but eventually we encountered some amazing views over a valley, which you can see pictured above. After the hike we cleaned up our tent and gear and drove to Fort William. After setting our tent up here at the North Face Car Park, we explored the small town a bit. We had some drinks at a pub called the Great Glen and eventually we had dinner there too. Although it was definitely not the best pub, quite busy and a bit chaotic, it was very cheap and the food was decent enough. We must say, it was actually hard to choose a pub in Fort William, because the main street has a lot of choices. Take the gondola over the Nevis Range Mountain. Get fish and chips at a local pub. Glenfinnan is on the way to Mallaig; the town where you can catch the ferry to the Isle of Skye. 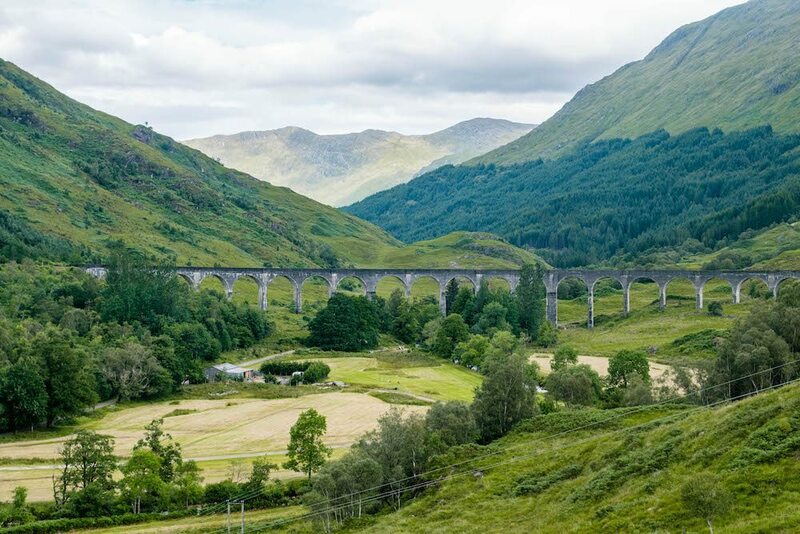 We recommend a pitstop at Glenfinnan to see the famous Harry Potter Bridge. Once we made it to Mallaig we couldn’t go on the ferry until 18.10. Therefore we recommend booking your tickets beforehand. If you happen to have some extra time over in Mallaig too, visit the Tea Garden Café. We had some tea and cake here and it was delicious. Plus, it’s such a cute cafe with lots of plants and flowers. What we found interesting here was that they actually had treats for dogs on their menu, which is apparently quite common in Scotland. We love it! When we finally arrived on Isle of Skye we easily found a place for our tent. Just like Glencoe, it is not hard to find a decent wild camping spot, as there is so much nature. At night we ate at this lovely restaurant called Claymore. We highly recommend it! It was delicious and certainly not too expensive, although a bit above our usual budget. Check out the restaurant recommendations and things to do on Isle of Sky after day 6. Visit Glenfinnan and the famous Harry Potter Bridge. Do the Mallaig Circuit Walk. Today is a full day of exploring the beautiful Isle of Skye. There so much to see and so much to do! Isle of Skye is perfect for a road trip and there are plenty of gorgeous stops. For instance, you can visit the Neist Point Lighthouse. It’s quite a walk up there from the car park, but you’ll be impressed by the beautiful landscape surrounding the lighthouse. Near Neist Point Lighthouse we went to this little coffeeshop along the road called Lephin Café where we ordered soup, tea and coffee. It was such a cute little place with home made caramel slices, cake and more. When we tried to pay their card machine did not work and we didn’t have cash with us, so they told us to transfer it “whenever we feel like it”. Aren’t Scottish people the best? We definitely recommend a stop at this café. After that there is enough time to drive around and take another stop at this incredible viewpoint where you can see Kilt Rock and Mealt Falls. Just park your car at the carpark and you’re there. Excellent for those who aren’t fan of hiking but want to see a beautiful view. When we were here there was a man in a kilt playing the bagpipe; it doesn’t get more Scottish than that. If you’re craving pizza, we recommend eating at L’Incontro, located in Portree, in the evening. They definitely have delicious choices. Check out the restaurant recommendations and things to do on Isle of Sky after day 6. During this day was the morning that we woke up and Jeffrey had two ticks, so we went to Boots for a tick removal kit. We recommend to buy a tick removal kit before you go on your road trip. Be sure to check out our packing article for other travel essentials. Another day to explore the Isle of Skye. If the weather is good, pack your swimsuit because the first stop is the Fairy Pools. Personally, we didn’t take any swim wear with us. We were surprised to see many people swimming and the temperatures at Isle of Skye. It was really summer! After your visit to the Fairy Pools, head over to the Old Man of Storr and hike up for a good view. Be sure to bring enough water with you! If you’re craving fish and chips, or even if you’re not, visit the Portree Harbor. There you will find the cutest pastel painted houses where there are multiple restaurants that serve fish and chips. Walk to the the Neist Point Lighthouse. Visit the Kilt Rock and Mealt Falls. Hike up to the Old Man of Storr. 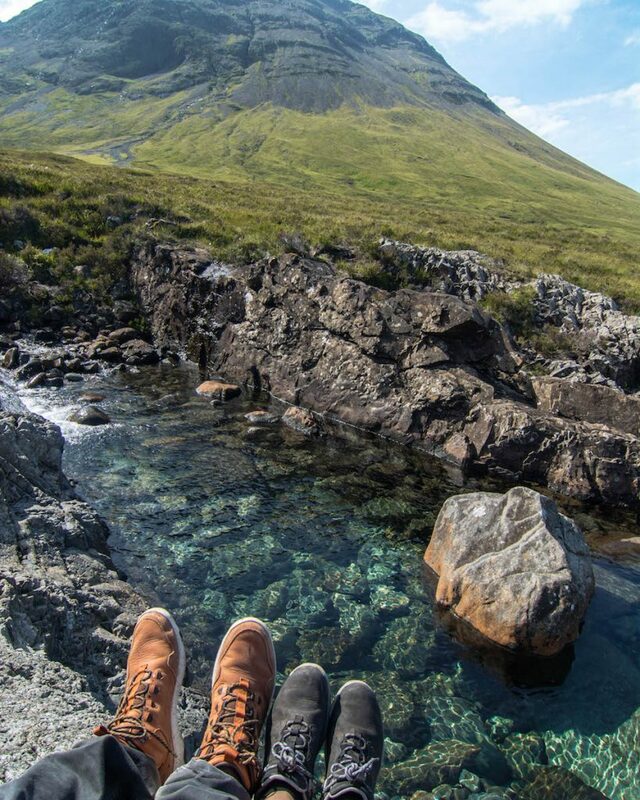 Take a plunge at the Fairy Pools. Get fish and chips at the colourful Portree Harbor. Oh, how we love Edinburgh. A city full of history and so much beauty! After five days of camping, it’s wonderful to arrive at a comfortable Airbnb or hotel and take it easy. If you are looking for some relaxing after all the hiking and camping like we did, we recommend taking an easy day and visit a spa, or just read a book in a cosy cafe. On our first night in Edinburgh we had the most amazing dinner at an Italian restaurant called La Piazza. We really can’t recommend this place enough. 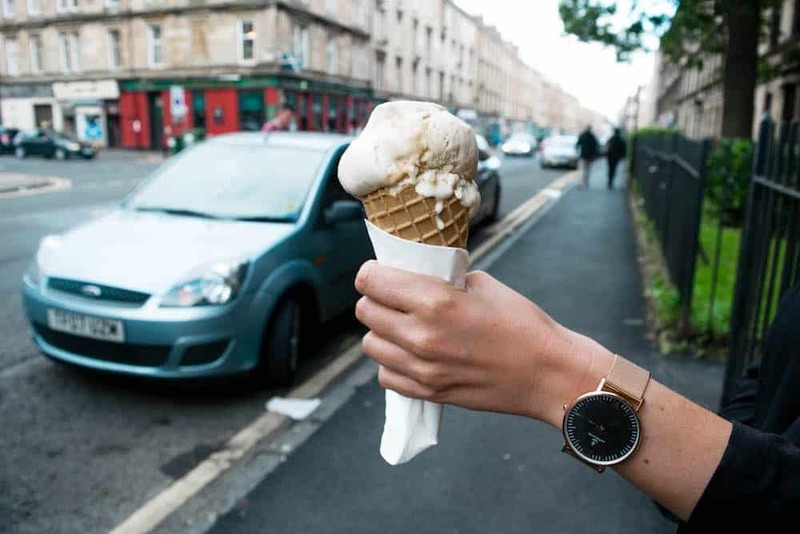 Check out the restaurant recommendations and things to do in Edinburgh after day 8. Wake up early to make the most of your day, and to beat the crowd a bit. If you’re in Edinburgh in the summer season, it can be extremely busy. 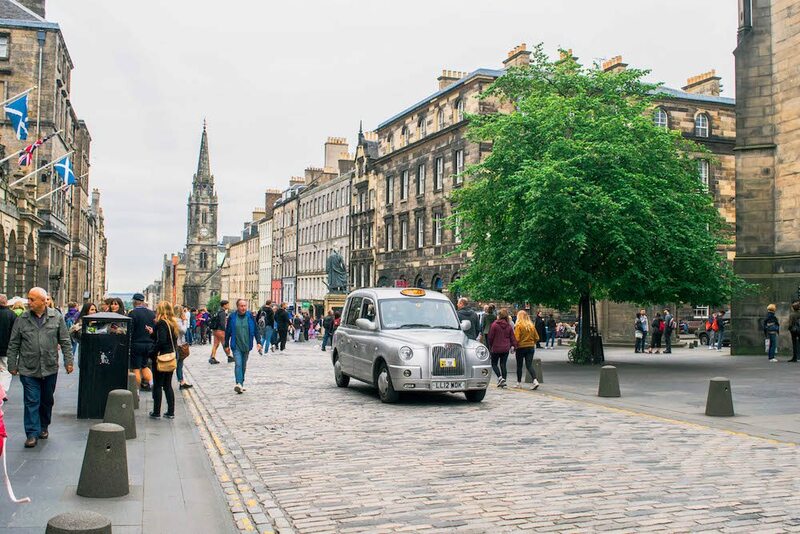 We recommend a visit to the lovely Princess Street, where you can not only shop, but also admire the Edinburgh Castle and the Princes Street Gardens. From here you can walk around the city to explore the architecture, restaurants and cafés. Don’t forget to visit the lovely Victoria Street with all the cute coloured houses. 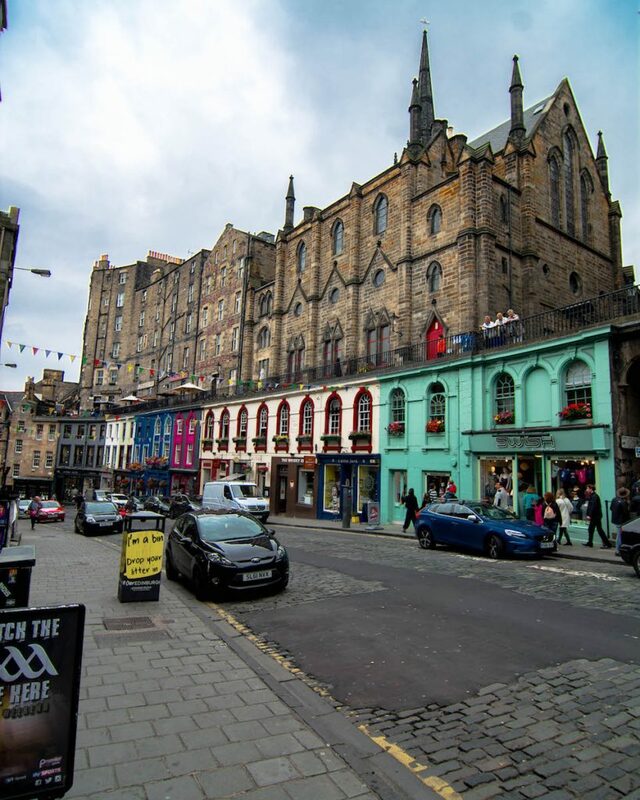 At night you can visit one of the amazing pubs in Edinburgh, there are countless of options. Visit One Spa in Edinburgh. Take a walk at the colourful Victoria Street. Visit one of the many pubs. Your last day in Scotland! You can decide to explore Edinburgh a little bit more or go back to Glasgow in the morning and spend more time there. Make sure to make enough time to bring back the car to the car rental and don’t miss your flight! We hope you have an amazing time in Scotland and that our itinerary proves to be useful. If you have any questions about this itinerary, let us know in the comments below or you can always use the contact form to e-mail us. So jealous. We’ve planned a similar trip years ago, but the wrecked the car two weeks before and couldn’t afford the trip anymore. Somehow never managed to go back to Scotland to explore it. Need to put this back on the bucket list, such a beautiful country. Great post! 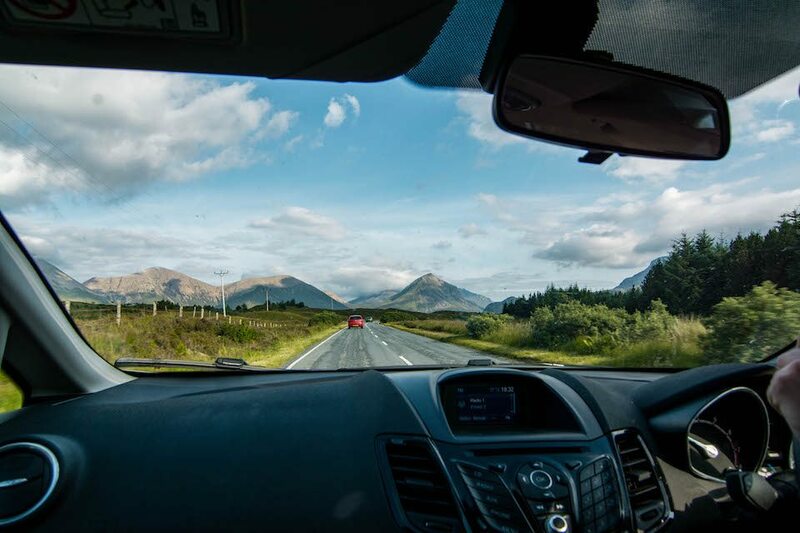 I’m half-Scottish but have never really travelled there even though it’s just up the road from London really…I have been thinking I should do a road trip this summer, so this is a useful guide, thank you! This is so great! 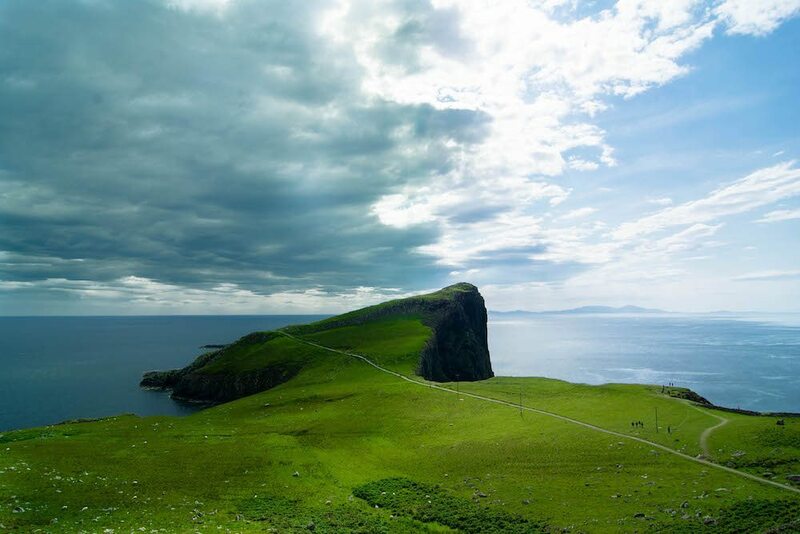 I have been wanting to go to Scotland for soooo long – the whole country just looks so amazing. Definitely saving this for reference later! beautiful! i love your photos! i cannot wait to visit! Wow, your photos are absolutely stunning. I have never been to Scotland, but it looks so beautiful. Especially I like the nature and mountain views you posted! Scotland looks like such a beautiful country, so green and full of history! Would love to go someday and am definitely going to keep this itinerary handy! 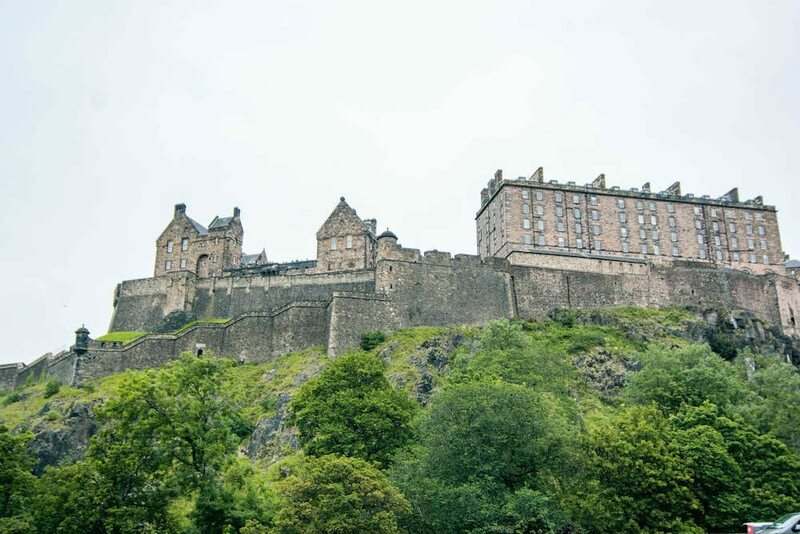 I have only visited Edinburgh but I bloody loved it and would love to roadtrip Scotland – this sounds like the perfect itinerary! So many beautiful spots in Scotland. I really loved Isle of Skye. Want to go back and spend more time in the Highlands and Glasgow. Pinned your post for future reference. Great itinerary! I am ashamed to say that although I grew up in the UK and spent most of my life there, I have never actually been to Scotland! I’ve been planning a trip to Edinburgh with some friends though and I’m excited to finally visit. Bookmarked this for later! Thanks for making this post. Great guide. I really ought to go back to Scotland and see it properly – I visited briefly with my parents when I was young but didn’t really appreciate it back then haha. A road trip now sounds perfect so saving this for later! Awesome article, very informative. I have to look into the tick removing kit! Do you find this itinerary a good pace or did you feel like it was too much moving around? Also, the Harry Potter bridge, do you have recommendation on now to get to that point? Hi Caitlin! Thanks for your comment. For us it definitely was not to much moving around. I must say we did not do every activity I listed, but they are merely suggestions. But for visiting the destinations it’s definitely doable! I would perhaps wanted one more day in Edinburgh, because I loved it there. I felt that five days for the Highlands is quite good if you’re just going to two places there! The Harry Potter bridge is quite easily found by going to Glenfinnan, but there is this certain location where you can take an epic photo from, which I often see on Instagram. I will sent it to you; I bet we can find the right location after a bit of Googling!